Are you the victim of fearful thoughts? Then you took the bait! Don’t be a victim any longer. Click on the video and learn how to resist fear. To live a transformed life, you need to overcome fear with the mind of Christ. How has God helped you overcome fear? Just leave your comments in the box below. Would you like to stop worrying? 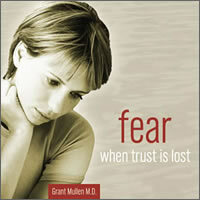 In Fear, when trust is lost, you will learn the 3 sources of fear and how you can have victory over each of them. My initial reaction to bad news generally is fear, worry & anxiety. I agree with Dr. Mullen it is missile and it’s origin is the devil himself. It generaly knocks me off Kilter getting my eyes off of God. I do it all the time, it’s a habit. I am involved in a ministry called Celebrate Recovery and one of our ministry leaders submitted their resignation. I was overcome by all three emotions above. My worry was, what’s going to happen to CR. This is a very valauble person stepping down. Will it continue or fall apart? Who is going to replace her? I was frozen for a moment. Over the next 24 hours I finally got my eyes back on God and focused. I realized again CR is God’s ministry. I think I was fearful becuase I was worrrying about what people would think of me if the ministry fell apart. I am also one of the ministry leaders and the one who initially got it going. Finally God’s word helped me to realize I am not defined by the success or failure of CR. God is in charge. He will provide. I am defined by who I am in Christ. I am His child, I am justified in Christ, I am whole and complete in Christ….etc. Finally peace began to flood into my soul again. God is my Provider. Amen! i was lost and i was down i got the fear that i am alone and there is nobody to help me in my problems. i have no more joy in everyday life and feeling that God is far away. but there is always word that come to me 77x 7God will restore me. at this point i believe Jesus speaking to me. walk and fokus only to him.like peter he walk in the water ,coz his focus is only to him but when he realize that his walking he fall.this is become a reality coz now i know the secret that JESUS is the answer to all problems and fear have no effect when i am following Jesus steps. Fear is such a constant battle for most of us. I think that’s why the Bible so often says “fear not”. IN MY OPINION, FEAR IS THE EXACT OPPOSITE OF FAITH. I HAVE HAD MANY OCCASIONS WHERE FEAR TRIED TO ‘OVERWHELM’ ME BUT, I MADE A DECISION WHEN I FEEL FEAR TO QUOTE THE HOLY WORD OF GOD. IT HAS BEEN MY EXPERIENCE ON MANY AN OCCASION THAT FEAR ‘ BECOMES SOMETHING ALMOST TANGIBLE ‘ AND ENGULFS EVERY PART OF ME BUT WHEN I ADDRESS IT WITH GOD’S WORD BY SAYING OUT LOUD THINGS LIKE ” GREATER IS HE THAT IS IN ME THAN he THAT IS IN THE WORLD !” OR ” GOD HAS NOT GIVEN ME A SPIRIT OF FEAR OR COWARDICE BUT A SPIRIT OF LOVE , POWER , AND A SOUND MIND! ” THEN THE FEAR THAT WAS GRIPPING ME , DISAPPEARS . Fear in my opinion is just like faith. Only it is negative faith. True positive faith believes that something good will happen. Fear which is negative faith believes that something bad will happen. Both believe that something will happen. If we fear, just like faith we pull that thing we fear into being. So when I fear something, I just get praying and deal with it that way. i LIKE WHAT YOUR SAYING GRANT. yOU MINISTERY IS NEW TO ME AND I APPRECIATE ALL THE FREE INFORMATION YOU PROVIDE ON YOUR WEBSITE. I WOULD LIKE TO APPLY YOUR THOUGHTS TO MY LIFE BUT I FIND IT DIFFICULT.. I HAVE EXPERIENCED ANXIETY FOR MANY YEARS. AS A FOOTNOTE I AM NOT SURE I TOTALLY AGREE WITH YOU ABOUT WHAT YOU STATE THAT JESUS DID NOT EXPRESS FEAR. THIS IS OBVIOUSLY EVIDENT BEFORE HIS CRUCIFIXTION AT THE GARDEN OF GETHSEMENE. hE WAS SO AFRAID THAT HE SWEAT DROPS OF BLOOD. Kevin, Jesus was not afraid. Fear is when you are uncertain of the future. Jesus knew exactly what would happen. He was not looking forward to such suffering. But he did it all because of his love for us. Amazing! Since I am still dealing with phobies and anxiety -I would like to know if you have a clinic where I could go to get help! I am taking my retreat from work at the end of June and will be free with my time. Thank you so much for reading me – I will wait for your reply.